Oooh, your printemps are so shiny! I love the illusion of looking down into an endless well. Really lovely work! beautyful. this challenge is great, totally agree with you. happy week to you. Oh wat mooi, lieve Mariet. I like your expressive style.!! 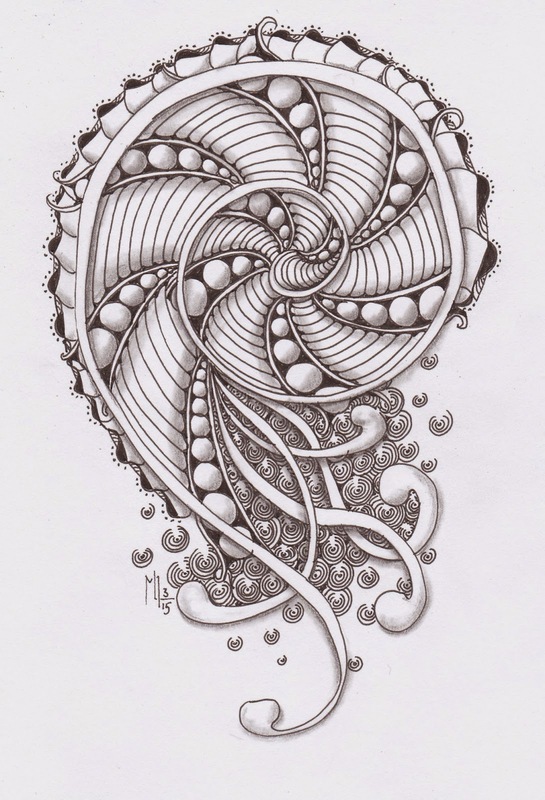 Lovely spiral, love how those printemps are cascading out of your spiral. Beautiful interpretation. I scrolling back up and looking again and again. Very nice, I love how you filled the spiral. This is gorgeous! I especially love the sparkly printemps. Your shading and sparkles really bring this to life. Beautiful! Very beautiful ! And I love the mooka you added to your spiral. My first thought was "sea creature" . all the patterns work well but I especially love the Dragonair round the "shell" with the dotty aura. Lovely. Heel mooi! Prachtige lijnen en ook Printemps heb je heel mooi geplaatst. Gorgeous! I still haven't made that good of friends of mooka. It all came together sooo beautifully! Wat mooi, hoe zo'n spiraal overgaat in Mooka! Printemps doet het ook erg goed. oooh! wauw!!! dit IS mooi! I love your spiral. So beautifiul and creative! Beautiful and elegant! Love the mooka that flows from your spiral! Very lovely. I like the Printemps spilling out, they always remind me of bubbles.